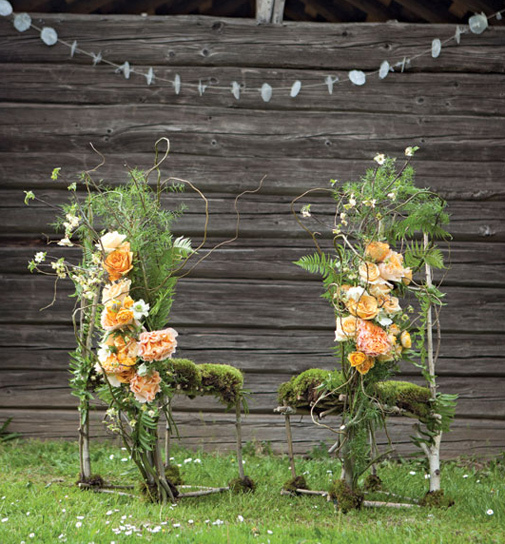 secured to bamboo chairs from Portland’s The Party Place with tulle. Tablecloth, vases, candlesticks, candleholders and chair bows from Geranium Lake Flowers. Runner prices start at $295. 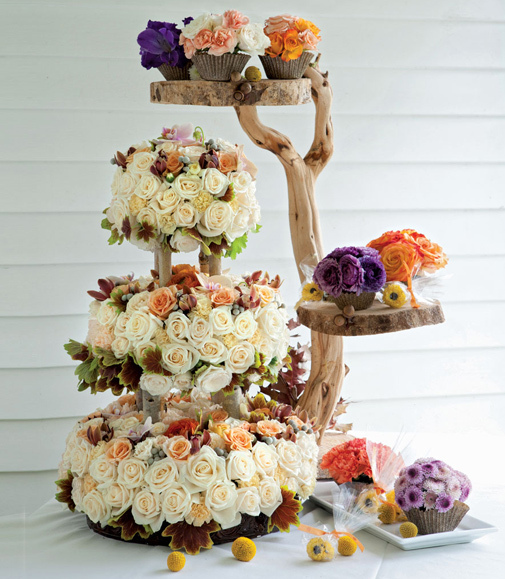 A dessert table accented with floral confections that look good enough to eat is the creative work of Chuck Schomaker and Wendi Day of Old Town Florist in Portland’s Pearl District. 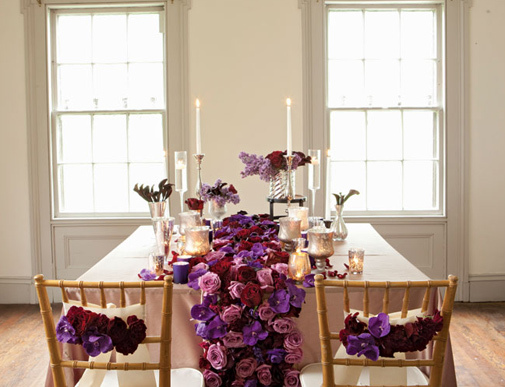 Three tiers of Vendela and Surprise Roses, grown by Peterkort Roses, are punctuated by gray brunia berry and chocolate mini cymbidium orchids while festive “candies” made from cellophane wrapped Billy balls and yellow sunflower roses decorate the table. Delightful “cupcake” favors on a sandblasted manzanita branch were created out of gladiolas, orange spray roses and button mums. Tablecloth from Peter Corvallis. Cupcake stand and cupcakes, prices start at $300; cake, prices start at $500. Dogwood branches provide the underpinning to charming bride and groom chairs crafted by Stephanie Major of Portland’s Petalos. With seats covered in spongy Mood moss and decorated with Chapenella peach garden roses, Capriccio roses, Peterkort peach avalanche roses, ferns, anemones and Gold Ignace spray garden roses, these chairs are more decorative than functional except for the lightest duty, such as holding ceremony programs, bouquets or ring pillows. Pair of chairs, prices start at $644. 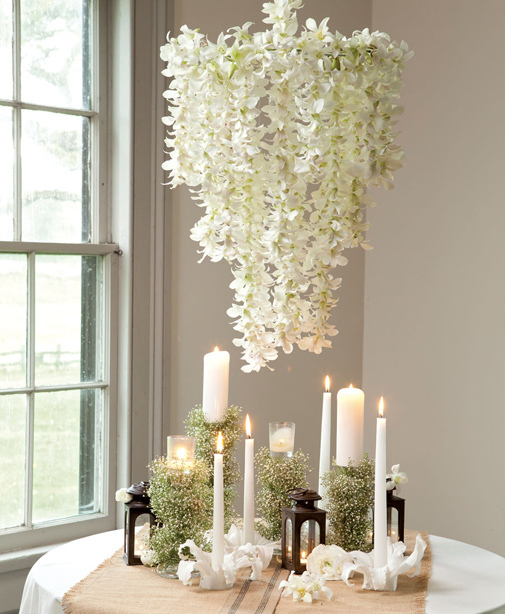 Creamy ivory Dendrobium orchids drip from a chandelier creating an elegant and intimate place for the head table, cocktails or lingering over the guest book. Jordan Gladow of Northwest Portland’s Blüm, placed the heavenly scented orchids over a table that finds two traditional flowers—baby’s breath and Casablanca lilies—in unusual roles as candle holders. Burlap tablecloth and mini lanterns from Pottery Barn. Light cream tablecloth from Peter Corvallis. Chandelier, prices start at $225; candle holders including bases and candles, prices start at $15. 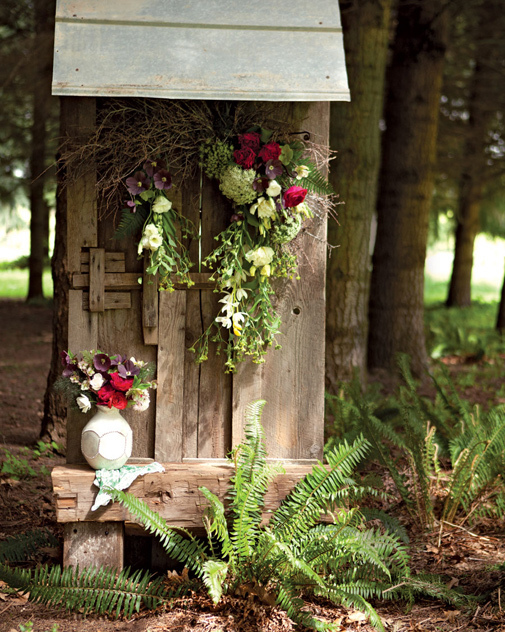 Tucked into a grove of pine trees and covered in forest flora, this altar space utilizes a reclaimed door from North Portland’s Salvage Works to create a serene spot for taking vows or just a special moment away from the crowd. Solabee, located in the Kenton neighborhood of North Portland, decorated the altar with a wreath featuring bitter bush, black hellebore, bupleurum greens, miniature cymbidium orchids, lisianthus, Darcy rose, Solomon’s seal, green Queen Anne’s lace, sword fern, and yulee fern curl. 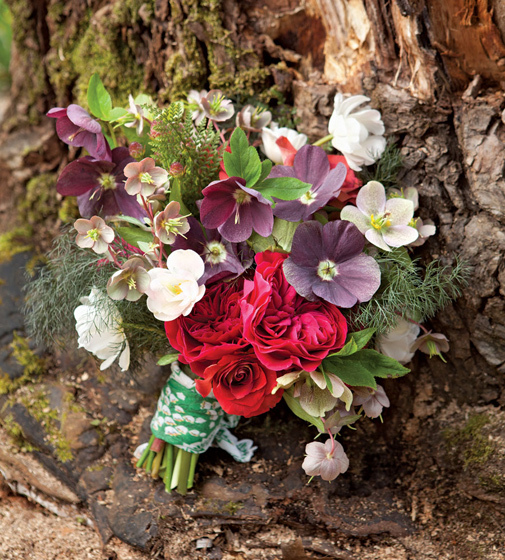 Solabee’s rustic bouquet sits in a pitcher by Pottery Barn and features three varieties of black hellebore, as well as black fennel, Alaskan fern, fuchsia Darcy rose, orange tulips, and leucadendron. Custom-built altar by Salvage Works, $425; floral arch, $175; bouquet, $150. Solabee bouquet (details above) wrapped in a vintage handkerchief from Kenton Antiques & Collectibles.